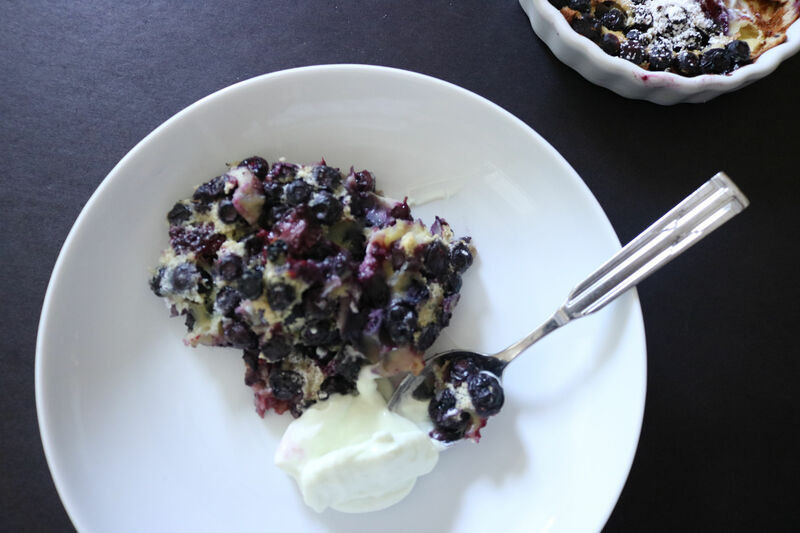 Blueberry Clafoutis can be considered a pancake, a custard or a crust less pie. A classic dessert worthy of breakfast or dessert with great nutrition in every bite! Myricetin and quercetin which are flavonoids can lower cholesterol ? Well blueberries do! I will enjoy being on my turf of Connecticut to revisit the farms that are all showing off there berry abundance and blueberries are the last of the pickings in July. Individuals taking Warfarin (coumadin) may have to consult with their physician due to the Vitamin K levels in the fruit may conflict with the drug. Preheat an oven at 375 degrees. Lightly butter or non stick spray a 8″ baking dish or 4 small ramekins. Mix the blueberries together with the lemon zest and the one tablespoon of the sugar. Pour the blueberries into the baking dish. In the same bowl, beat 2 eggs and sugar until lemon colored and slightly thick and add the vanilla extract and the mace. Add the flour and the milk and mix until well combined. Let rest for 10 minutes. 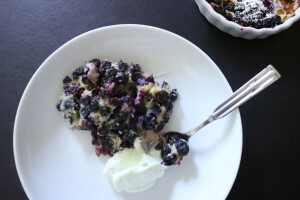 Stir again with a mixing spoon and pour over the blueberries in the baking dish. Bake for 45 minutes or until the top is puffed and lightly golden brown. Let cool for 10 minutes and serve with yogurt or ice cream.